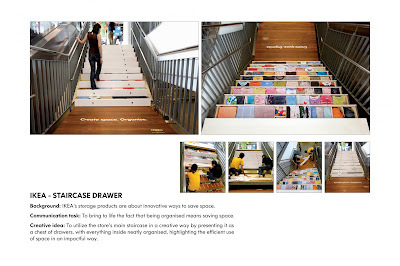 Ikea's storage products are about innovative ways to save space. To bring to life the fact that being organised means saving space. To utilize the store's main staircase in a creative way by presenting it as a chest of drawers, with everything inside neatly organised, highlighting the efficient use of space in an impactful way. Agency: Lowe & Partners Kuala Lumpur, Malaysia.